We are proud parents of two 11 year old Shih Tzu fur-babies that are like our children. Obsessed. Fully. We take great care in watching what goes into their bellies. Our boy, Mango, has tummy issues and a list of foods he’s sensitive to. Our girl, Pandie, has a stomach of steel…usually. When they started showing strange signs of illness last year, we took a step back and reevaluated their diet. That’s when we heard about the FDA cautioning pet owners about chicken jerky dog treats. Complaints and concerns from consumers are still popping up on the regular, along with petitions to ban foreign made treats from shelves. Very scary stuff! Even though we thought we were buying a good product, we realized the treats are made in China and quite possibly making our dogs sick. We started purchasing only American made products for our dogs at our local specialty pet food stores. Since the switch we have not had any more severe bouts with vomiting or diarrhea. While making room in the freezer we came across some left-over chicken breasts. That’s when Jvee decided to make homemade chicken jerky. I don’t eat chicken but Jvee does. So, whenever there is any left over, it goes straight to the dogs. 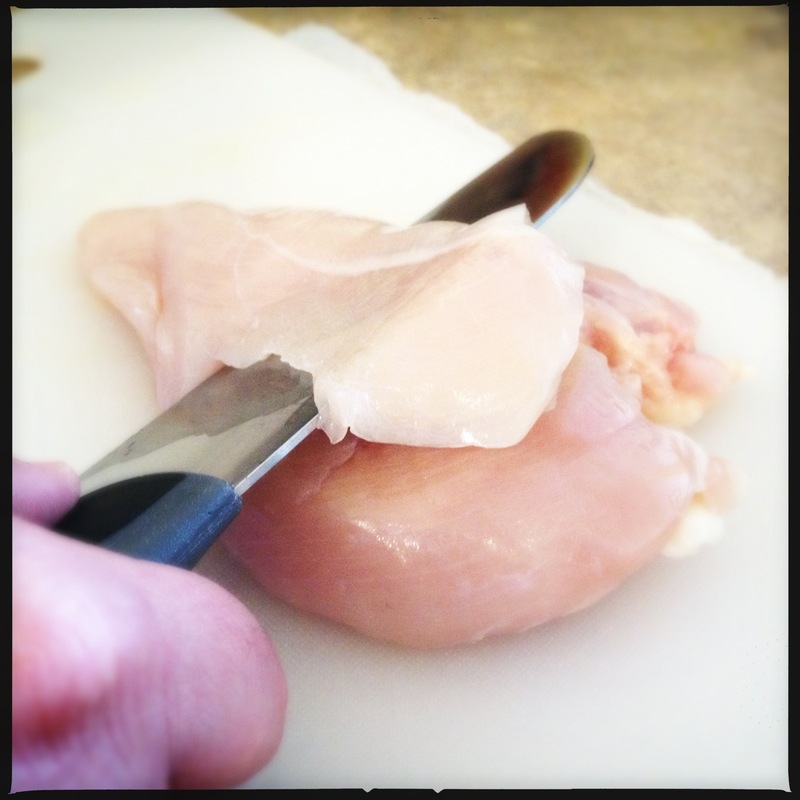 We use good quality chicken breasts. Remove any extra fat. Cut VERY thinly with a sharp knife. Grease a baking sheet with a small amount of olive oil to prevent sticking. 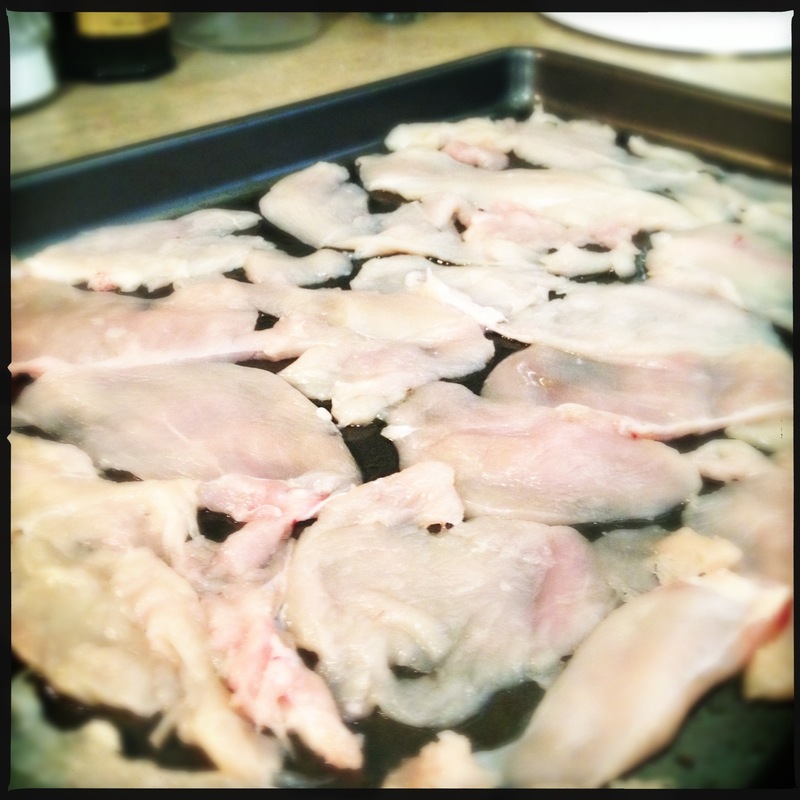 Line the sheet with the raw chicken pieces. Don’t worry, small amounts of olive oil is safe for dogs. Set your oven to 170 degrees fahrenheit and bake the chicken for about 8 hours until all the moisture is removed and it is dry. Be patient. Just let it hang out in there. Let the jerkey pieces cool completely. You can store these in airtight containers. Mango and Pan are so obsessed. They wait by the oven every time we make them. Not only are they feeling better, but we can bribe them to do just about anything now. Worth it. If your pups prefer biscuits, check out our Cheddar Peanut Butter Biscuit recipe. Oh, great idea! 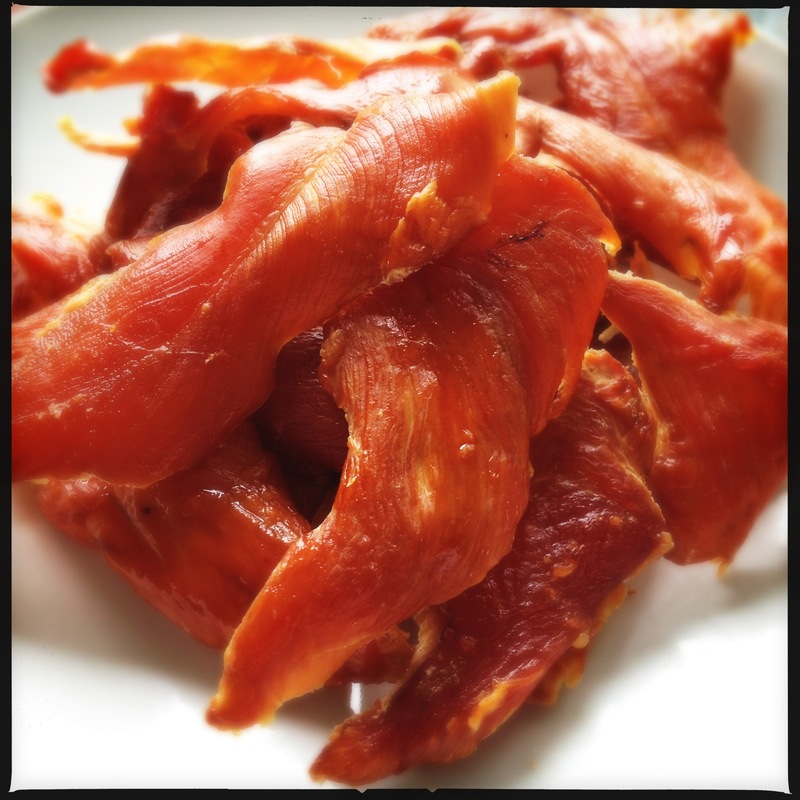 I didn’t realize it was so easy to make jerky…we also have a shih tzu fur ball and a bigger rescue mutt that would love these. Also, if I may ask – I am looking for a camera to take pictures with for my blog. Which camera are you using here (or do you have any recommendations)? Thanks! I hope you try them and your pups love them as much as ours. Thanks! The biscuits look good as well for the pups. I will look into the Rebel & point-n-shoots…I know very little about photography, so sometimes it can bet a bit overwhelming!